The methodology of sequence stratigraphy is defined as the study of rock relationships within a time-stratigraphic framework of repetitive, genetically related strata bounded by surfaces of erosion or nondeposition, and/or their correlative conformities (Posamentier et al., 1988) and (van Wagoner et al., 1990). This definition establishes that sequence stratigraphy is differentiated from lithostratigraphy in that sequence stratigraphy is used to correlate synchronous packages of depositional facies. 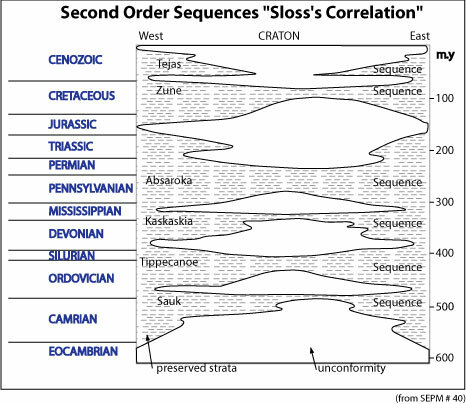 A sequence is defined as "a relatively conformable succession of genetically related strata bounded at its top and base by unconformities and their correlative conformities" (Vail et al., 1977). Thus a sequence is composed of a succession of genetically linked deposition systems (systems tracts) that are interpreted to have been deposited between eustatic-fall inflection points (Posamentier et al., 1988). Type 1 sequence boundary (SB1): An unconformity characterized by stream rejuvenation and fluvial incision, sedimentary bypass of the shelf, and abrupt basinward shift of facies and coastal onlap . This surface is interpreted to form when the rate of eustatic fall exceeds the rate of basin subsidence at the depositional shoreline break, producing a relative fall in sea level at that position. Type 2 sequence boundary (SB2): An unconformity characterized by stream rejuvenation and fluvial incision, sedimentary bypass of the shelf, and abrupt basinward shift of facies and coastal onlap . This surface is interpreted to form when the rate of eustatic fall exceeds the rate of basin subsidence at the depositional shoreline break, so producing a relative fall in sea level at that position. 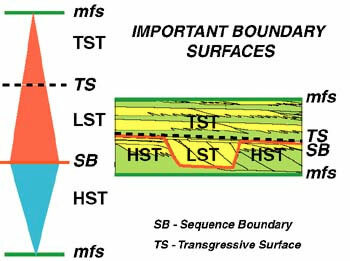 The shelf-margin wedge systems tract (see below) is associated with this type of sequence boundary. Most carbonates, unlike siliciclastics, are "born, not made" in the depositional setting (Goldhammer et al., 1990) which means considerable data about their generation can be inferred from the sediment character. That specific carbonates accumulate in specific settings means that carbonate production certain conditions must have been met and maintained in order to sustain a particular character. Thus the depositional environment must have been just right for the production of particular carbonate, meaning that the sea may not have been too warm, or not been too cold; not been too shallow, or not been too deep; not been too fresh, nor been too saline; had not too many nutrients; while the sea floor had not too fast a subsidence, was not too stable; and there was not too rapid sea rise or fall; so meeting the conditions for the "Goldilocks megacycles" of Goldhammer et al. (1990). Variation in carbonate stratal patterns and lithofacies are controlled by five (or more) major variables: a) tectonic, b) eustatic change, c) volume of sediments, d) climate, and e) oceanography. Relative sea level variation (which controls the accommodation space for sediments to accumulate) is controlled by the combination of eustatic position and tectonic subsidence or uplift . Relative sea level fluctuations are a major control over carbonate production and the resultant stratal patterns and lithofacies distribution. Basins are created and destroyed as a result of tectonism. Subsidence of basin is commonly a direct result of tectonic processes (either those of extension, thrusting, wrenching, flexural loading, etc.). In a general sense, the tectonic setting controls the latitude of the basin as it responds to the movement of crustal plates. Today, most carbonate sediments accumulate in the warm tropical and sub-tropical belts (30 degrees North and South of the equator). The Arabian shallow shelf that contains carbonate platforms along a passive continental margin of the Late Jurassic Neo-Tethys in which tectonic movement was very slow and regionally distributed. In this setting minor variations in the eustatic sea level would have had great effects on carbonate deposition. The West Texas and Southeast New Mexico Permian basin carbonate which formed in a foreland basin setting and is characterized by differentiated platforms formed when the lithosphere was loaded below the Marathon thrust belt to the south. eustasy');">eustasy is defined as a global sea level change when referenced to a fixed datum , for instance the center of the earth. It should therefore be independent of local factors. Variation in eustasy may be a result of either changing ocean-basin volume similar to that produced by variations in the rate of ocean-ridge spreading, or changing ocean-water volume (glacio-eustasy). If treated independently from tectonic subsidence, fluctuations in eustatic sea level control the exposed area of a basin during either erosion or transgression. Haq et al. (1987) proposed a global sea-level chart in which third-order relative sea level is attributed to eustatic origins (see below for further discussion on third-order cycles) (Emery and Myers, 1996). base level');">base level is defined as the surface to which sediment accumulation fills up to or erodes down to. Commonly base level is equated to relative sea level position but it can be related to the water surface of lakes and/or local equilibrium surfaces associated with river systems. 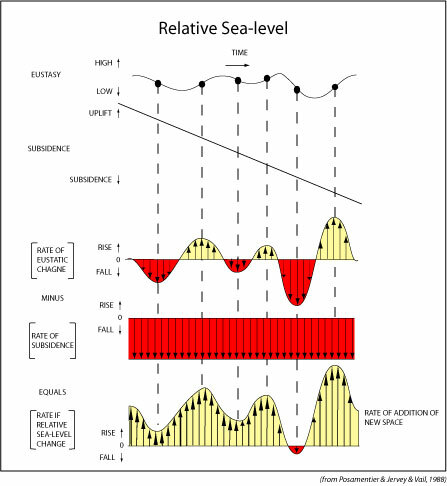 relative sea level refers to the position of sea surface relative to a fixed datum near the sea floor. 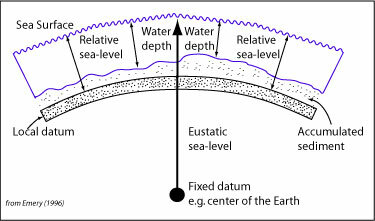 relative sea level involves two components: eustasy and vertical movement of the sea floor (tectonism and/or sediment compaction) (Posamentier and Allen, 1999). The volume and rate of sediment accumulation (the product of carbonate production and erosion) controls the speed at which basin is filled by carbonate sediment and subsequently controls the depositional architecture (e.g., whether facies belts prograde, aggrade, or retrograde). Accommodation is defined in this text as the potential space available for sediment to fill. This space is the product of the combined movement of the sea surface (eustasy: global sea level measured from a datum such as the center of earth) and movement of the sea floor, a function of changes in relative sea level (Jervey, 1988). "Δ accommodation = Δ eustasy + Δ subsidence + Δ compaction. Δ water depth = Δ eustasy + Δ subsidence + Δ compaction - sediments deposited." carbonates. When this climate is arid then high rates of evaporation and the deposition of evaporites (either supratidal or subaqueous) are a common response. Karstification of exposed carbonate platforms may occur during sea level lowstand by rainfall in humid regions (James and Kendall, 1992). Water temperature and circulation, light penetration, oxygenation, and salinity have a direct and paramount bearing on carbonate production (James and Kendall, 1992). carbonate production decreases sharply below 60 meters of water depth due to lack of the necessary light for carbonate fossils photosynthesis. carbonate production is greatest in the upper 10 meter of water column (Kendall, 1992). A highly oxygenated warm water (20 degrees C) is ideal for high carbonate production. High levels of salinity may drown the platform and kill most of the invertebrates, which can't tolerate over 40% water salinity. First-order cycle: A cycle of relative or eustatic change of sea-level that has a duration in the order of 100 to 200 million years (Mitchum, 1977). 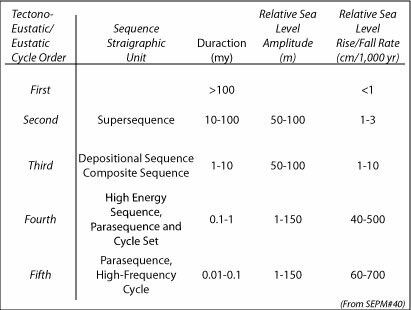 Second-order cycle: A cycle of relative or eustatic change of sea level that has duration in the order of 10 to 80 million years . Super cycles are second-order cycles (Mitchum, 1977). Third-order cycle: A sequence deposition during about 1-10 million years. This sequence has no internal unconformities and consists of systems tracts and their constituent parasequences. composite sequences (fourth-order consisting of fifth-order high frequency sequences) deposited in 1-10 million years are common in the rock record (Mitchum, 1977). Fourth-order cycle: Global sea level changes at the scale of a few hundred thousands of years, which are thought to be caused by changes in global ice volume (Mitchum, 1977). Fifth-order cycle: Global sea level changes at the scale of a few ten thousands of years which are produced by Milankovitch climate cycles. These are the sedimentary products of variations in the Earth's orbital behavior that produced periodic changes of climate, which influenced sea level and depositional patterns and facies (Mitchum, 1977). Includes all the deposits that have accumulated after the onset of relative sea-level fall , and as long as shoreline regression continues and lies directly on type 1 sequence boundary. The carbonate factory is shutdown and the shelf is exposed to erosion and/or karstification (producing secondary porosity). A clastic source would be brought closer to the basin of accumulation (more so in a rimmed basin) so enhancing the quantity of clastics transported into this basin. Furthermore, rivers and wind transport siliciclastics to the lowstand shoreline while sediment gravity flow-funnels some of these sediments into the deep basin (e.g. as the case for the Brushy Canyon formation of the Permian basin of West Texas) (Schlager, 1999). The carbonate factory is moved basin-ward and is productive over a narrower area while deeper basins may be starved of carbonates since very little carbonate sedimentation occurs on the shelf. In shallow basins, facies belts will migrate downward and develop offlapping geometries (a so called forced regression). Start-up: sedimentation lag behind sea level rise. Catch-up: sedimentation exceeds sea level rise. Keep-up: sedimentation equals sea level rise. Just the opposite of the LST, the TST shallow facies belts will shift landward producing shallowing-upward cycles capped by evaporites. When deep basins occur, the potential for the deposition of source rock facies is the greatest during this phase. 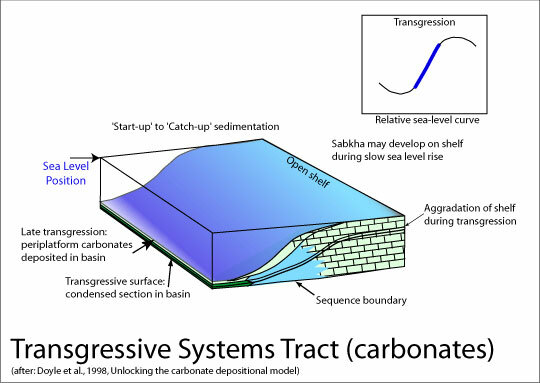 The HST is formed by the regressive deposits that accumulate when the sedimentation rate exceeds the rate of relative sea-level rise . The shallow shelf is widened, producing and shedding the greatest quantity of carbonate sands that have the best potential for forming reservoir rocks. The prolific carbonate sand production on the shelf margin outpaces the relative sea level rise or standstill and aggrading prograding geometries are produced as carbonates migrate basin-ward. As accommodation space shrinks, cycles become progressively thinner. 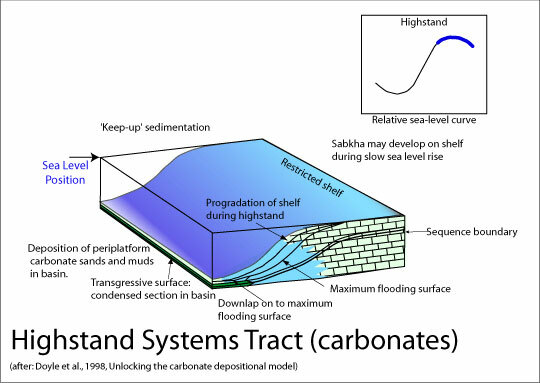 HST carbonates downlap the maximum flooding surface (mfs). 1. The differentiated carbonate shelf of the eastern Arabian Plate is separated from the open ocean by the continental margin with no, or very little, deposition occurring east of this margin (Murris, 1980). The differentiation of the shelf into the site on which a series of parallel shallow water facies collect occurs during sea level highstand (see Wilson facies distribution. The Hanifa source rocks of the eastern Arabian Plate were deposited during the maximum basin differentiation (i.e. the greatest variation in lateral facies accumulated). As the basin fills it reverts slowly back to a carbonate with cyclic alternation of argillaceous units which can be correlated over large distances. It's during this transition that the sediments of the Arab formation of the Upper Jurassic accumulated. Ramps can evolve into a flat-topped rimmed carbonate platform as a result of high carbonate productivity on the margin (Wright and Burchette, 1998). For more details on the Hanifa intrashelf (source rocks), please refer to the Hanifa sequence stratigraphy section. 2. Carbonate shelf: Wight and Burchette, (1998) define a carbonate shelf as a shallow, flat-topped structure that forms a clearly defined margin with a steep slope down to the adjacent basin. The Permian basin Shelf is a classic example of carbonate shelf. carbonate basins profiles can be broken to zones based on variation of water-depth. Each zone is the site of the accumulation of distinct sedimentary facies that collect as a result of the various controls discussed in section I (relative sea level, climate, etc.) These facies are defined as bodies of rock characterized by particular combinations of lithology, physical, and biological structures that enable their differentiation from surrounding rock bodies. Ramps are characterized by gentle slope (< 1o) over which carbonate development is controlled by the depth of the fair-weather and storm wave base. Sediments grade from supratidal sabkha deposits to beach sand, to fine grains, and finally to lime mud in the deeper waters. On the other hand, a land-attached carbonate shelf has a more defined margin such as that of the carbonate belts surrounding deeper basins in the Permian basin of the southwest U.S.
Wilson (1975) developed an idealized sequence of nine standard facies belts on the basis of wave energy (low-energy basin, high energy shore and low energy interior) . For each facies belt, Wilson assigned a number (1-9) and provided a description for the facies, lithology, color, grain type and depositional texture, bedding and sedimentary structures, terrigenous clastics admixed or interbedded, and biota. These belts are: basin, open sea shelf, deep shelf margin, foreslope, organic buildup, winnowed edge sands, shelf lagoon open circulation, and restricted circulation shelf and tidal flats, evaporites on sabkhas or salinas. Wilson also identified 24 standard microfacies (SMF) for describing these various facies belts.. The high frequency sequence stratigraphy concepts used here are adopted from Kerans and Kempter (2002) where the deposition of the Guadalupian sequences of the Guadalupe Mountain of west Texas and southeast New Mexico is described. They have adopted the conceptual model of clastics devised by Mitchum and Van Wagoner (1991) and have modified it to describe a mixed clastic/carbonate shelf-to-basin stratigraphic successions. Lithofacies (facies) lithofacies are the basic descriptive three-dimensional rock elements recording a specific depositional setting or event and can be interpreted in terms of water depth, depositional energy, and sediment supply/biologic input. Example of lithofacies include wackestones-mudstone, sandstone, etc. (Kerans and Tinker, 1997). High-frequency cycle "cycle" The high-frequency cycle "cycle" is the smallest set of genetically related facies deposited during a single base-level cycle. cycles are comparable to and often equivalent to the "parasequence". cycle boundaries mark the turnaround from base-level fall to base-level rise (a period of time during which sea level rises from a highstand position, through a lowstand, and returns to a highstand). cycles can be mapped across multiple facies tracts and include multiple vertical facies successions (VFS) and are therefore chronostratigraphic units (Kerans & Tinker, 1997 and Mitchum & Van Wagoner,1991). Facies tract Genetically linked association of lithofacies and vertical lithofacies successions (VFS) that record a discrete energy/water depth/sediment supply setting. High-frequency sequences (HFS) The term high-frequency sequence was designated for higher-frequency unconformity-bound sequences within larger packages of sedimentary sequences. high-frequency sequences may have all of the attributes of depositional sequences, including lowstand, transgressive, and Highstand systems tracts and their component parasequences and parasequence Set');">parasequence Sets or the cycles and cycle sets of (Kerans and Tinker, 1997). high-frequency sequences can be divided into systems tracts (LST, TST, HST) consisting of retrogradational, aggradational, and progradational cycle sets . This section uses the terminology of Kerans & Kempter (2002) for describing the carbonate sequence stratigraphic hierarchy. Composite sequences These are sets of genetically related sequences (third-order) arranged in a distinctive retrogradational, aggradational, and progradational patterns and bounded by unconformities. These higher order sequences stack into lowstand, transgressive, and highstand sets. This combination of cycle shoaling, cycle stacking patterns (thinning or thickening upward cycles, the stratal geometry (based on stratal geometries such as downlapping, truncation, etc. ), and evidence of exposure are used to identify sequence boundaries (Kendall and Alnaji, 2002). Kerans and Kempter (2002) define composite sequences (CS) as sequences made of high-frequency sequences (fifth-order sequences), which are in turn made up of high-frequency cycles (parasequences in van Wagoner's terminology). Each high-frequency sequence is made up of systems tracts. Each systems tract is made up of lowstand, retrogradational (transgressive) and progradational (highstand) cycle sets . facies tracts are defined as belts of genetically related time-transgressive depositional facies within the systems tracts; each facies tract is specific to the depositional environment in which it exists. For example the Restricted sigmoid clinoform Ramp Model includes the following facies tracts: middle ramp, ramp crest, outer ramp, distal outer ramp, and basin; while the Reef-Rimmed Shelf Model include shelf-edge reef facies tract. Kerans and Kempter (2002) identified five dominant HFS-scale depositional models describing the development and progression of the upper Leonardian-Guadalupian. 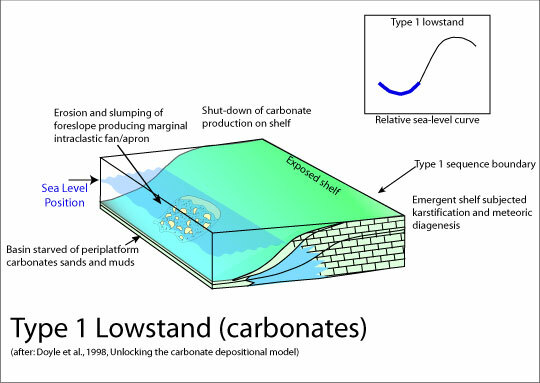 These models include distally-steepened ramp, sigmoid-progradational ramp, exposed platform, shelf bypass, transitional mixed siliclastic-carbonate ramp to rimmed shelf, and reef-rimmed shelf. Lithofacies (facies) and facies tracts define the characteristics of the depositional environment in which these facies were deposited and are described by their grain types, grain-sorting, and sedimentary structures. Upward shoaling vertical facies successions (VFS) are used to describe facies tracts and vary in thickness depending on sea level fluctuation and available accommodation space. Fenestrae (fenestral fabric) primary or penecontemporaneous voids in the rock, framework larger than grain-supported interstices. Commonly associated with cyanobacterial mats and can be the result of shrinkage, gas formation, and/or organic decay, etc. mudstone refers to carbonate rock composed of carbonate mud (mud-supported) with less than 10% of allochems (Dunham 1962). Grainestone carbonate rock composed of grains (grain-supported) with no carbonate mud in the interstices (Dunham, 1962). Micrite microcrystalline calcite; used both as a synonym for carbonate mud (or "ooze") and for rock composed of carbonate mud (calcilutite) (Folk, 1959 and 1962). Packstone carbonate rock composed of packed grains (grain-supported) with carbonate mud matrix (cf. grainstone and wackestone; Dunham 1962). Peloid an allochem formed of cryptocrystalline or microcrystalline carbonate irrespective of size or origin. This term allows reference to grains composed of micrite or microsparite without the need to imply any particular mode of origin (can thus include pellets, some vague intraclasts, micritized fossils, ooids, etc..). Log responses can be used to infer the penetrated lithology and the depositional setting in which these rocks accumulated. They produce distinct responses that indicate organic richness (low-to high) and can be used for the identification and correlation of the primary source rocks in upper Middle Jurassic source facies interpretation. Often source rocks are tight (3-5% porosity), but are rich in organic matter (TOC >1.0% wt.) (Ayres et al., 1982). Logs can indicate porosity, presence or absence of organic matter, presence of liquids, etc. Log character is used to construct models in which vertical trends in cycle thickness (fining or thickening upward) occur and this alternation can be used to determine the larger sequence framework and its response to the changing water depth. sequence boundaries, maximum flooding surfaces, and systems tracts can be deduced from this cyclicity and thinning/thickening trend. If a match with the eustatic sea level curve can be established, identifying the primary attributes that establish sediment depositions can also be determined. This log measures of the speed at which sound travels in the formation, and is related to both the porosity and lithology of the rock being measured. Thus, if the lithology of a formation is known, this log can be used to determine its porosity. sonic log values (in ms/ft) vary in range of 65-100 microseconds/ft depending on porosity and in the case of high carbonate contents (highly resistive) produce low sonic velocity. So the higher the sonic value (DT in microsecond/ft), the lower the velocity (ft/microsecond), and the higher the porosity (less dense) of the rock being measured. Some rock types sonic response values are: limestone 47.5 us/ft, dolomite 43.5 us/ft, anhydrite 50 us/ft, and halite 67 us/ft.